Just outside Bergamo’s Città Alta (upper town), Il Gourmet Ristorante Hotel offers guests a convenient yet peaceful location with stunning views from the terrace and many of the guest rooms. Il Gourmet, in Via San Vigilio, is a short walk from Porta Sant’Alessandro, one of the gates in the walls surrounding the medieval Città Alta. It is close to the station for the funicular to San Vigilio and is also near Via Borgo Canale, the street with the house where Bergamo composer Gaetano Donizetti was born. As the name implies, Il Gourmet prides itself on the meals served in its restaurant, which offers Bergamo specialities and Mediterranean cuisine. Il Gourmet’s wine cellar is stocked with many of the top labels from Italy and further afield. You can either dine on the terrace with panoramic views over Bergamo or in Il Gourmet’s smart dining room. Il Gourmet’s building dates back to the 17th century when it was once a private residence. It was converted to a hotel at the beginning of the 19th century to accommodate the travellers and merchants that came to Bergamo with their goods. 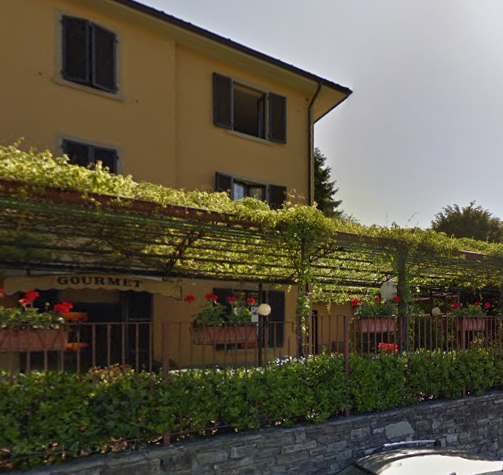 Set in the green hills above Bergamo, Il Gourmet provides guests with a peaceful relaxing atmosphere while being handy for the Città Alta and the terminus of the bus route to the Città Bassa (lower town), the railway station and Bergamo Caravaggio Airport at Orio al Serio. There is also ample parking for guests with cars. Il Gourmet has nine double rooms, one single room and an independent apartment with two double bedrooms, a sitting room and a private terrace. The rooms all have air conditioning, a fridge bar and satellite television.